Fproduct is pleased to announce the successful completion of a collaborative project with Rem Koolhaas, the founder of OMA. 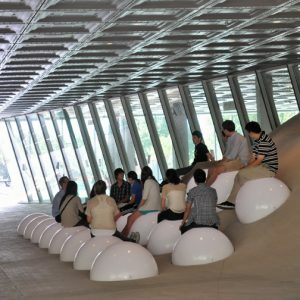 Fproduct helped to design and custom-build 21, illuminated exterior seating pods for the entrance of the new Milstein Hall, for the College of Architecture, Art and Planning (AAP) at Cornell University in Ithaca NY. The light emitting exterior seating pods complement the overall building design and provides an interactive component that students love to use.